The extension of the capital's tram line to Newhaven was initially estimated at £165m. 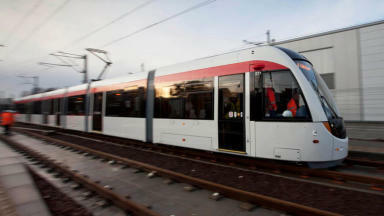 The extension of the Edinburgh tram line to Newhaven is now expected to cost more than £200m, it has emerged. The project was initially estimated at £165m, with the FBC saying the extension can be delivered within a £196m budget. However, recommended "optimism bias" of 6% takes this to £207.3m. Council leader Adam McVey said: "We need to invest in our capital city's continued success and deal with the growth of our population in a sustainable way. "Edinburgh has a fantastic public transport network but we need to extend tram to build on our first-class, fully-integrated transport system. "As Scotland's fastest growing city, things simply cannot continue as they are - the transport system must evolve to cater to a rapidly growing population. "The FBC before us now is the result of a huge amount of work by the project team to produce a strong business case for taking trams to Newhaven which - crucially - does not divert funding from other council services." "As Scotland's fastest growing city, things simply cannot continue as they are - the transport system must evolve to cater to a rapidly growing population." Construction of the tramline began in 2007 and saw an eventual £776m bill which was more than double the sum earmarked at the outset. Mr McVey added: "Having developed the case further and gone through the tender process, we now have much greater certainty of the total project cost - following industry guidance, learning the lessons from the previous project and taking a thorough, diligent and prudent approach to risk management. "We will work to make sure the timelines and costs in the final business case are met. All successful major infrastructure projects depend on extensive scrutiny and this major project is no different. "All councillors will be taking the opportunity to examine in detail the FBC and associated documents in detail so that we can collectively make as informed a decision as possible come March 14. "If the council moves ahead with this project, we'll be working hard to make sure we deliver this project on time, on budget."